In Designer Boxes, students build on the work they have done with area and perimeter and extend it to 3-dimensional solids. The focus is on solving packaging problems and, in particular, on investigating measurements and characteristics of boxes. In the lessons, students not only learn about volume and surface area, but also improve their abilities to reason spatially. For example, students learn about the relationships among faces, vertices and edges of rectangular prisms and how to make and label drawings of boxes. They explore nets of cubes and rectangular prisms and then use the nets to determine the surface areas of solids. Chapter 1 explores the concept of volume. This chapter expands volume concepts to rectangular solids of varying shapes and sizes by asking students to construct models from interlocking cubes. The emphasis throughout the chapter is on the development of concepts, as well as understanding why the formula for volume, V = lwh, works to determine the number of cubic units in a rectangular prism. Students must build an understanding of this formula by linking the idea of layers of cubic units to multiplying length by width to find the number of cubes in one layer. 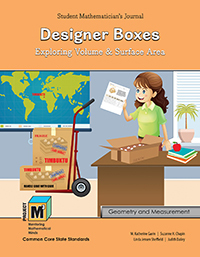 Chapter 2 focuses on surface area as well as provides an opportunity to synthesize the work in Chapter 1 by building and measuring boxes. Since measurement is complicated—it involves conceptual understanding of length, area and volume as well as procedural understanding of how to measure and what tools are appropriate. This chapter gives students a culminating experience with all aspects of measurement by having students design and make their own boxes and decorate them with mathematical information they have researched.